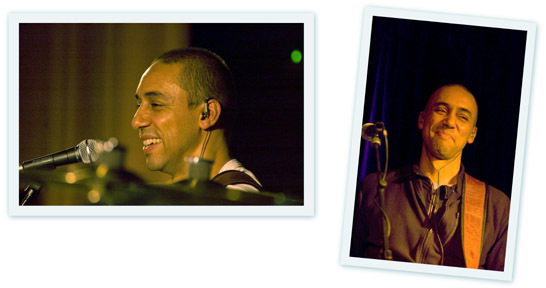 I got to know Lothar in 2004 when I become keyboard player with the Vicky Leandros Band. During our first phone conversation, he mentioned that we had already met: In the hallway of the building where my daughter lives with her mother. Our daughters not only live in the same building, but on the same floor. What a coincidence. With Vicky, Lothar plays the saxophone, flute, guitar, bass and sings. Once, when we were playing with Vicky in Athens, I told him quite honestly: "Lothar, you are the best! ... but what in? We killed ourselves laughing. Anyone who has experienced Lothar live, knows exactly what I mean. He defies description! Lothar is from Hamburg. His dad was from the Carribean, where he was a very well known musician. You can feel the Carribean sun in Lothar's songs and in his whole way of being. For decades (he's not 25 anymore) he's been bringing his many talents to a variety of formations. He's founder and leader of La Saxa, a very entertaining saxophone quintet. As singer or musician, live or in the studio, he's collaborated with people like Simon Webbe, Inga Rumpf, Herb Geller, Marianne Rosenberg, Yvonne Catterfeld and many more. As lead singer of the "Steve Bourbon Project" he published the CD "Rock the Club" (with Sylt Lounge). For a few years he's also been playing in the band with Klaus Lage. Klaus and I had been thinking, if we should go on tour as a duo (piano and vocals). Or maybe as a trio? So it was natural to suggest Lothar, who plays saxophone, flute, guitar, bass and percussion and he sings to boot. Klaus was enthused and we recorded the 2006 K.L. CD "Zug um Zug" as trio and went on tour with this small formation.